It wasn’t long after Navy Medical Corpsman Steven Bizeur of North Port, Fla. came ashore on Kwajalein with the 4th Marine Division he became a casualty himself during the war in the Pacific. 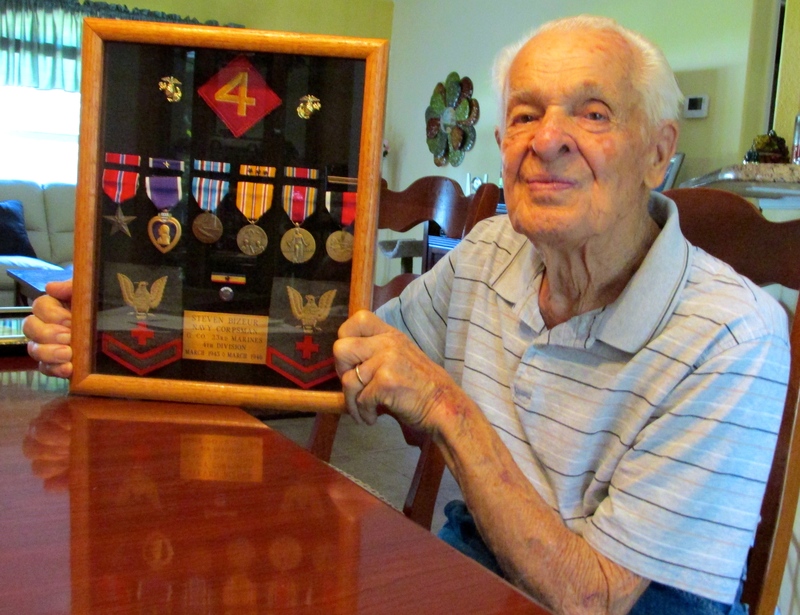 “I was in a foxhole on the beach with two other Marines when a grenade landed among us,” the 90-year-old local resident recalled. “When it exploded I was wounded in the left leg from shrapnel. The other two ‘Leathernecks’ weren’t hurt. In less than a month Bizeur was almost as good as new again. He was sent back to the 4th Marine Division that had moved onto Saipan by then. Then came the 36 day battle of Iwo Jima that began for the Marines assaulting the beach on Feb.19, 1945. When it was over 6,800 Marines, Sailors and Airmen died capturing the eight-square-mile volcanic island. Another 12,000 were wounded. The Japanese lost almost all of the 22,000 soldiers defending the tiny Pacific atoll. The reason U.S. forces captured Iwo Jima at such a terrible cost in lives is that the two air fields on the island would be used by American B-29 bombers as emergency landing strips on their return flights from bombing the Japanese home islands. Each B-29 had a crew of 10 airman and some 2,500 damaged bombers landed on Iwo Jima. Although Bizeur doesn’t remember much about the incident, he has a rice-paper thin commendation awarding him a Bronze Star for his bravery during the 4th Marine Division’s fight to capture the island from the Japanese. It reads: “The President of the United States, the Commanding General, Fourth Marine Division Fleet Marine Force takes pleasure in awarding the Bronze Star Medal to Pharmacist Mate 3rd Class Steven J. Bizeur, USNR for service as set forth in the following Citation. “For heroic achievement in connection with operations against the enemy while serving as a hospital corpsman attached to an assault rifle company on Iwo Jima, Volcanic Island on 28 Feb. 1945. Pharmacist Mate 3rd Class Bizeur, noticing four severely wounded Marines lying in an exposed position unhesitatingly advanced through heavy enemy mortar and machine gun fire to go to their aid. After rendering first aid and despite a painful wound suffered while making the rescue he singlehandedly evacuated the casualties to the battalion aid station. He refused to permit himself to be evacuated until he had guided a relief corpsmen back to his platoon’s position. His initiative and courageous leadership were in keeping with the highest traditions of the United States Naval service. Bizeur and the Marines of the 4th Division also received a Presidential Unit Citation for their efforts on Iwo Jima. “For extraordinary heroism in action during the seizure of enemy Japanese-held Iwo Jima, Volcano Island, Feb. 19-28, 1945. “Landing against resistance which rapidly increased in fury as the Japanese pounds the beaches with artillery, rocket and mortar fire the Assault Troops of the Fifth Amphibious Corps inched ahead through shifting black volcanic sands, over heavily mined terrain, toward a garrison of jagged cliffs barricaded by an interlocking system of caves, pillboxes and blockhouses commanding all approaches. “Often driven back with terrific losses in fierce hand-to-hand combat, the Assault Troops repeatedly hurled back the enemy’s counterattacks to regain and hold lost positions, and continued their unrelenting drive to high ground and Motoyama Airfield No. 1, captured by the end of the second day. “By their individual acts of heroism and their unfailing teamwork, these gallant officers and men fought against their own battle-fatigue and shock to advance in the face of the enemy’s fanatical resistance. They charged each strong point, one by one, blasting out the hidden Japanese troops or sealing them in. “Within four days they had occupied the southern part of the Motoyama Airfield No. 2. Simultaneously they stormed the steep slopes of Mount Suribachi to raise the United States Flag; and they seized the strongly defended hills to silence guns commanding the beaches and ensured the conquest of Iwo Jima, a vital inner defense of the Japanese Empire. Four days after the U.S. Marines charged ashore the American flag was raised on Iwo Jima. At first Marines on the beach thought the war was over because ships off shore tooted their whistles when the flag went up. They had no idea there was still more than a month of deadly fighting they would have to endure before the tiny island was free of Japanese troops. Eight days after setting foot on Iwo Jima, Corpsman Bizeur was wounded a second time. When he got out of the hospital he thought he might be headed back to the States. It didn’t work out that way. He didn’t have enough points that would entitle him to go home and be discharged. Although the war was over by this time Bizeur was put aboard a ship and sent to Japan to become part of the occupation force. For the next six months he remained there until he amassed enough points for discharge. 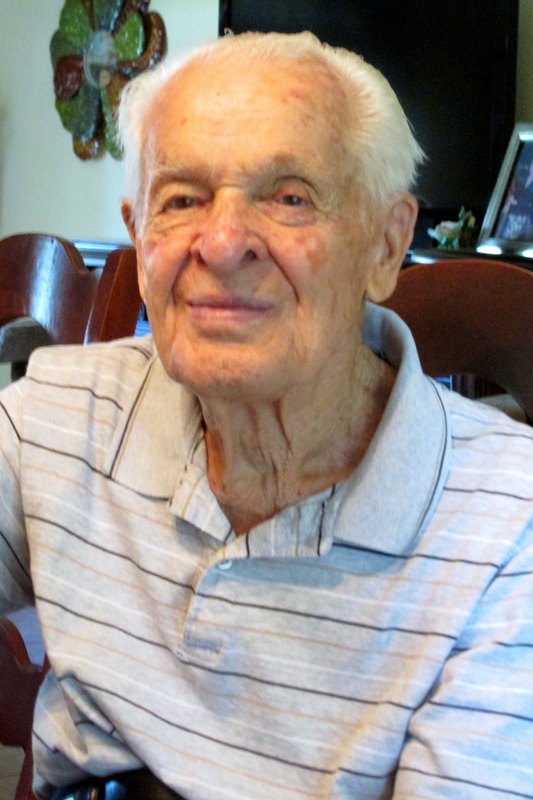 “I came back to California in 1946, grabbed a slow train back to Boston that took the better part of a week and was discharged from the Navy,” he said. He and his wife, Germaine, got married in February 1948 and he eventually went to work as an engine mechanic for Delta Airlines. He worked there 32 years until he retired in 1985 and the couple moved to North Port. They have four grown children: Sandra, Steven, Michael and Bruce. This story was first published in the Charlotte Sun newspaper, Port Charlotte, Fla. on Monday, Sept. 21, 2015 and is republished with permission. Click here to view Bizeur’s collection in the Library of Congress. These Navy Corpsmen were the bravest of the brave. My local group just spoke with a gentleman named Cpl.Richard Brown from Hershey, Pa. who also served in the 4th and was on Iwo Jima and was wounded there on the 11th day. 91 and still going strong!